Graduates of UCU at a past graduation ceremony. Courtesy photo. 43 graduands will be awarded first class degrees, with the best overall student, Nicholas Wani, having a CGPA of 4.82 in Public Administration and Management. Female students performed better than their male counterparts, with 24 females obtaining First Class degrees as opposed to 19 male students with First Class degrees. 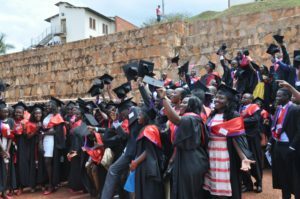 The graduands who include 569 (50.1%) males and 567(49.9%) females will walk away with bachelors degrees, diplomas, post-graduate degrees and masters degrees. Uganda Christian University vice chancellor Rev Dr John Ssenyonyi speaks at a past graduation ceremony. Coutesy photo. The Bachelors of Laws programme has the highest number of students graduating, with 285 students followed by Bachelors of Social Work and Social Administration that has 116 graduands. This graduation ceremony will also feature the maiden graduation of Bachelor of Governance and International Relations as well as Master of Journalism and Media Studies graduands with 22 and one graduand respectively.